Music is something people love to share. Be it that amazing song you heard on the radio or that classic that's been stuck in your head for years, sharing your favorite music with someone is an experience. In the good ol' days of music, people used to share vinyl records and cassettes. Then as time passed by, CDs became a common stock in every music lover's household. Music fanatics would create special mixtapes for their friends or their lovers and gift them. Those gifts, you'll agree, were much better than any other material gifts. Needless to say, sharing your favorite music with your friends and lovers is a tradition that isn't going to die any time soon. Contrary to popular beliefs, the iTunes era hasn't really dampened the spirit of social music. There are many fabulous apps and services that help you share your favorite music with not just your friends but the whole world as well. Moreover, these applications also let you discover new music along the way, thus making your whole listening experience much better. 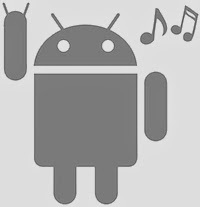 So, if you own an Android app, the following social music applications will surely come in handy. Soundwave is a brilliant application that lets you share your entire listening history with your friends and the world. It's basically a free application that sits quietly on your Android device. Once you install it, it will start tracking the music that you play on your phone. With the tracked plays, Soundwave creates a listening profile for you so that other people can discover what your music taste is like. It's similar to Last.fm but has much more socially oriented features built in. One really cool feature about Soundwave is that it tracks music from your Spotify and Rdio account, something that Last.fm fails at doing. There are many more cool features like listening to playlists of people nearby and filters that let you choose what appears on your playlist. Overall, it is a great app if you're an audiophile who loves to discover new music. Rithm brings a new twist to your listening experience. Once installed, it lets you share your favorite songs with your friends. 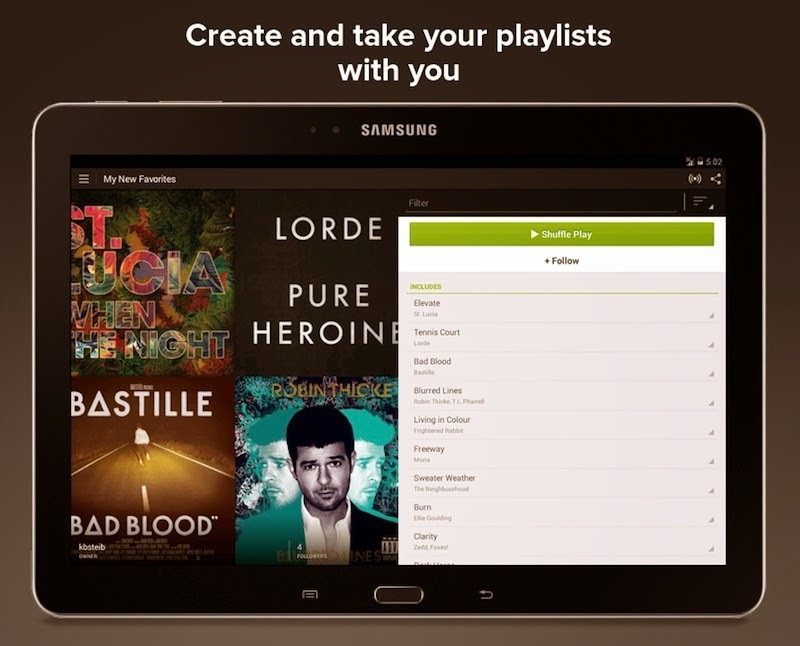 With a simple interface, Rithm lets you pick any song of your liking. 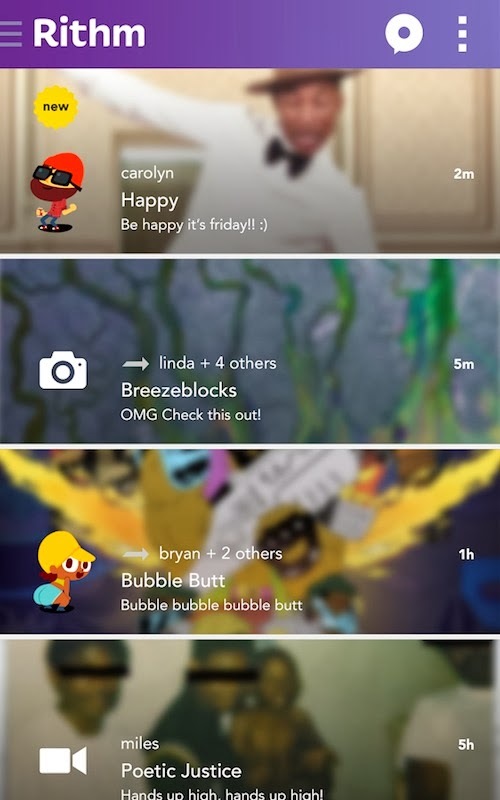 Then, you can add either a video, photo or an animated character to the song and send it to your friends via the app. This makes sure that the song you're sending to your friend has a little personal touch along with it. Apart from sending music to your friends, you can even share your favorite music on Twitter, Instagram, or Facebook. Though it doesn't quite pack the full features of staple messaging apps, it does offer something new to audiophiles who are looking for new ways to share their music. SoundCloud isn't just a service anymore, it has now become a full-fledged platform. It can be likened to YouTube of music and other audio content. Unless you're living under a cave, you must be well aware of the popularity of SoundCloud. Not only does SoundCloud discover new music, it also lets you upload your own music and share it with the world. Whether you are starting your own band or have some badass standup comedy skills, you can share your voice with the world without paying a single dime. 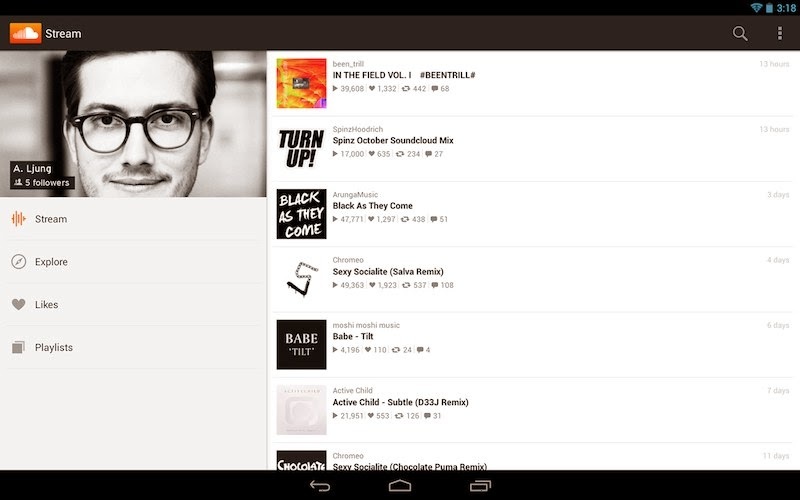 The SoundCloud app brings the same amazing features to your Android smartphone or tablet. It is definitely worth a try. Spotify is a hugely popular music streaming service. Hailed as the Netflix of music, its ability to let users enjoy their music on all platforms has made Spotify a true rockstar. What is more special about Spotify, though, is that it allows you to share your playlists with the world. Whether you want to post your playlist on your blog or send it to someone via email, Spotify lets you do that with such ease that you'll be surprised. The app brings all the goodness of the service on your Android device.